What would happen if you took the extraordinary sophistication of German engineering and applied it to the challenge of creating the ??ber-chicken? You might create something like the Bielefelder. This breed was developed in Bielefeld, Germany in the early 1970s by a poultry breeder named Gerd Roth, and the breed is highly valued in its native country. Herr Roth used a number of breeds in developing the Bielefelder including the cuckoo Malines (also imported by Greenfire Farms), Amrock, Wyandotte, and the New Hampshire. In 2011, Greenfire Farms was the first to import Bielefelders into the United States. In 2013, we imported an unrelated bloodline of Bielefelders. The introduction of modern chicken breeds is often accompanied with much hype, but in the case of the Bielefelders the superlatives happen to be true. If you could choose only one breed of chicken to keep the Bielefelder would be the breed to select. Their large meaty carcasses, huge eggs, autosexing function, gentle temperaments, and beautiful feathers make them a top choice in almost every category. Bielefelders consistently lay some of the the largest brown eggs of any chicken breed that we have kept at Greenfire Farms, they lay them in very impressive numbers, and they start laying at a young age. The eggs are a color that is unique to this breed. 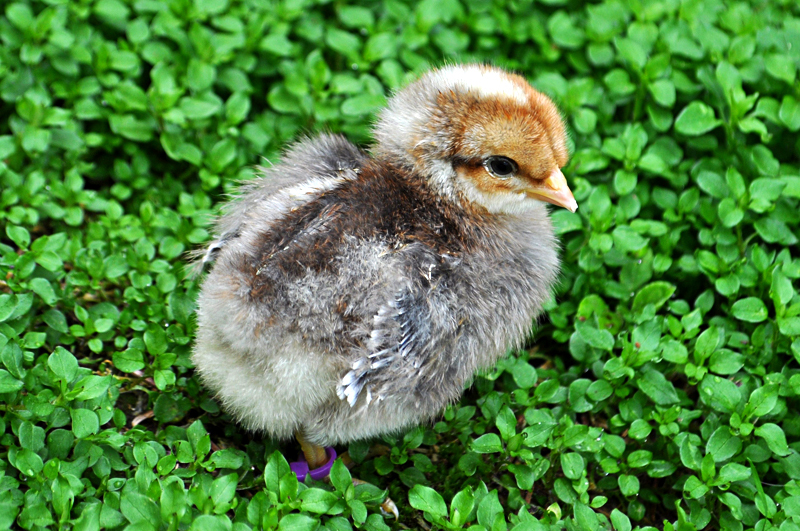 Their beautiful shade of brown, which often contains pink undertones, is distinct in appearance from other chicken breeds. Hens are also unusual in that despite their large size they are extremely gentle, and you can remove the eggs from under the hens without being pecked; a practical everyday benefit given the mass and power of these birds. Embedded in the Bielefelder DNA is the autosexing function; day-old chicks can be easily sexed based on their feather color patterns, and this trait is passed on with each generation. To learn more about autosexing chicken breeds read the section on this subject on this website. The complex color pattern in the adults is known as Kennfarbig and in English would be called cuckoo red partridge. Even in its native land Bielefelders command a very high price today, and they are virtually unknown outside Germany.